A perfect summer afternoon at the Battery at Manhattan's Southern tip. A warm breeze, live music, cherry ice cream and friends. Come and play with me! Mistral IV on a perfect summer day, mid-July. Going out with Tom and Kate and testing the fancy new Mylar genoa. It feels like flying! 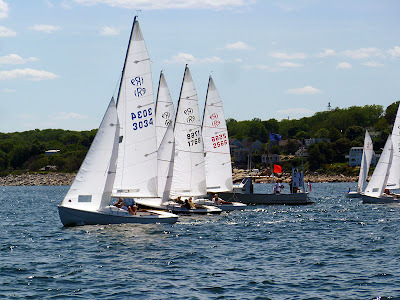 We saw at least a hundred sailboats out there, not only because of Larchmont race week. It was just the perfect summer sailing day. Mistral IV at her mooring at Larchmont Yacht Club, July 2012, with new boot stripe. Preface: The story of Kona Kai sailing down from Maine to North Carolina in the fall of 2011 shouldn't be stretched too thin but neither should the story be too short. I will post parts of the story here, not necessarily in chronological order (until the work is done), but to make a start I will publish parts of it before the whole text is written and all the photos are edited. Terror of the fish: Bro gearing up. Kona Kai was not on collision course, but out there, at night on the Atlantic Ocean, the distance of two, three nautical miles seems not that much when it comes to a standoff between her 34 feet of fiberglass and aluminum verse the 1,132 feet of pure steel of the RMS Queen Mary 2. Sailing at night can be deceptive, distances are hard to judge in the darkness, but this was for sure: Kona Kai was going down south along the eastern seaboard, coming out of Buzzards Bay, Long Island abeam. She was on a 209° course heading for Cape Hatteras, while the Cunard Line cruise ship was most probably steaming toward New York Harbor, and these course lines would intersect somewhere. The interesting question was when and where. Just listening to the ongoing VHF radio communication struck the sailors as awesome. Way ahead of Kona Kai sailed a two masted cutter roughly on the same course, out of sight, but their crew was concerned about an unsolicited meeting with the Queen Mary 2 as well. They had radar on board and could estimate the crossing point, so Kona Kai was absolutely safe. Majestic is an apt word to describe the impression the cruise ship made with her thousands of lights - bigger than the Titanic, a city of steel, silently floating by, overtaking Kona Kai on port, and slowly taking off, swallowed in its sheer mass by the darkness of the night. Now, except the four men aboard their boat, there were only about a million stars overhead, constellations leading the way. Hardly slowed down by any waves for the bow to plow through, they made good distance that night, everyone enjoying the magnificent silence on their lonely watches. The next morning brought uninvited passengers aboard. Just before noon on October 23rd, 2011, the crew saw them both, swirling around our vessel, not sure if they should dare to enter. 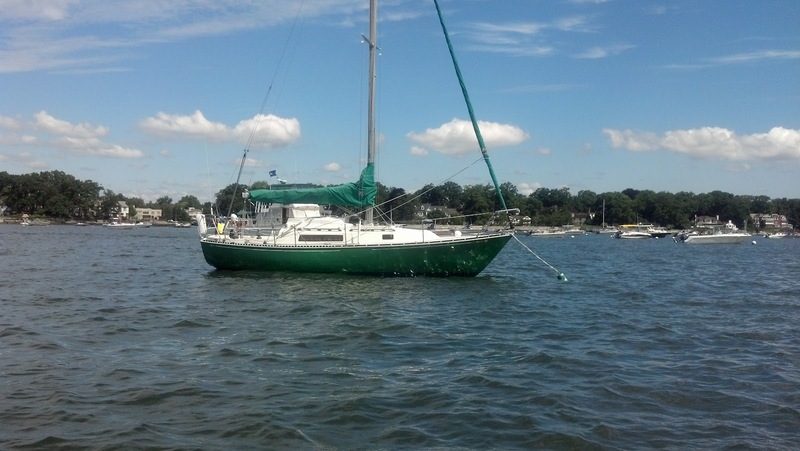 One of them finally gave in and favored a safe place on the foredeck over the threatening death by drowning. Just some minutes though, until one sailor came forward slowly to see what was going on and to take a picture of her. 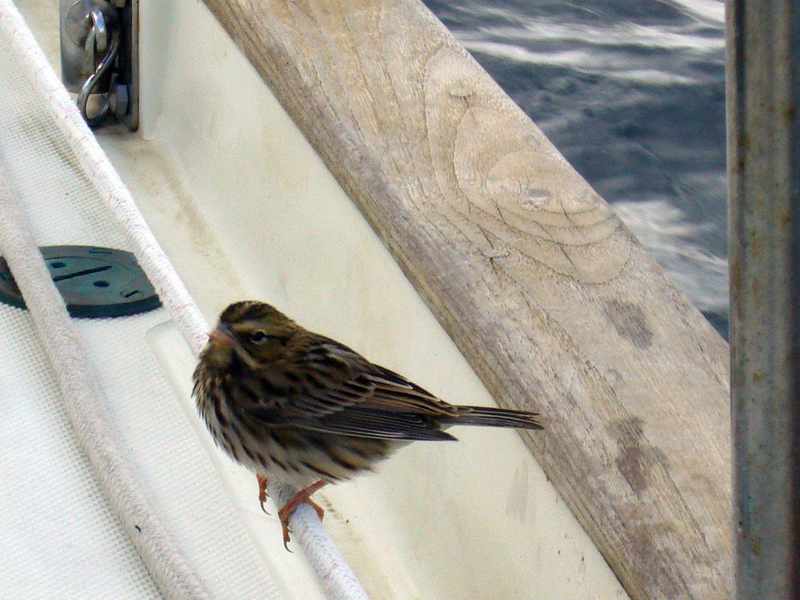 The poor soul was so stressed out that the little sparrow went airborne again and took off, probably to her sure death since we were about 50 nautical miles offshore. Being too afraid of the crew, she took off just a moment after landing - not a wise decision 50 miles offshore. Not so Sam Black. He landed with a visible impact on the starboard side of the cockpit. Panting and wobbling, plumes fluffed against the wind, the little sparrow could hardly keep his eyes open. "Shy" was obviously not a word in his book, and as far as hunger was concerned, there was no reason to refuse some sesame seeds and cracked peanuts the crew promptly offered. The bird even came onto their palms to grab a bite. Then, after about 15 minutes, the beast kicked back to proper life. Fattening up after a long flight: Sam appreciates sesame seeds and cracked peanuts. As soon as Sam was fed and watered, he hopped right down the companionway to explore the innards of his ark. The chart table featured a good lookout position and it was a short way from there to the quarterberth. It was not used for the crew's rest, but to store sails, electronics, pots and pans and everything else the crew didn't want between their feet. Sometimes the waves would rock everything in there back and forth, metal screeching, wood moaning, a life threatening commotion. But a real explorer doesn't flinch from going into the unknown. He respects danger and conquers it. So it was logically consistent that Sam chose this very place to sleep, climbing deep into the darker parts of the berth, where nobody could reach or even see him. Moving in: Sam inspects the quarterberth - his new sparrow-cave - from the chart table. The four sailors sat together and knitted their brows and stroked their beards, well, the two of them who had beards, and wondered where this bird might have come from. No bird of this size, they reckoned, would make it that far off shore on its own. Probably he made it over from the Queen Mary 2 the night before and simply tried to keep airborne until he discovered Kona Kai. That's what the sailors concluded and agreed upon. A hitchhiker on the seven seas, jumping ship whenever he felt the urge. Anyway, down there in his very berth Sam slept, safe and sound. "Shy" is not a word in Sam's text book. Here he pays Rob a visit. The crew were not even sure Sam Black was a sparrow, but a wildlife photographer confirmed this later after seeing these photos and browsing all of her bird books. She was sure that it was a sparrow, but couldn't pinpoint what exact rendition. So she called it a LBJ. LBJ? Yes, was the answer, a Little Brown Job, as birders call them. LBJs - birders call them Little Brown Jobs. But that's no matching name for this dude, here pulling the author's leg. Anyway, he looked quite dark, and he was adventurous. So the sailors stirred up some Dark & Stormies, and reminisced about some pirates to find an appropriate name for the bird who entered ship. Blackbeard a.k.a. Edward Teach came to their minds, who lost his head just off the Carolina coast. The name of the Disney figure Capt. Jack Sparrow was mentioned, and there they were, late at night: Sam Black just seemed an appropriate name. And so they went down below and followed the little tweet into their respective berths and into dreamland. Alas, one lonely sailor stood watch at the wheel, watching the North Star and Orion and the Big Dipper and the Small Dipper and all the other wonderful figures up on the firmament, telling their stories for so many centuries. The next morning brought new excitement for Sam and the sailors. Not only did they have the best ship's cook aboard they could imagine. They also got the most ambitious ship's cook they could wish for, so ambitious that he wanted to realize a plan unheard of: for every meal during their travels, he would prepare something different, not serving a single dish twice. Not even for breakfast, no, sir. And so the crew on Kona Kai had one food fest after another for two weeks in a row. The only downside was that Bro spent way too much time preparing meals and hardly ever saw the sun or stood at the wheel. Hooked! Now comes the hard part - reeling in. All the sailors loved fish, and there was a big hooraaaaah, when a skipjack tuna caught the hook at the end of the trawling fishing line. Bro fought the fish for quite a while, and because the sailboat was storming forward on a reach, it was hard work to reel the skipjack in. Finally Bro brought him alongside and Rob lifted him aboard with the help of a net. Still hooked on a pink lure. This one will feed four sailors. Bro thanks Poseidon and kisses the skipjack goodbye! The fish's skin was shimmering in all colors of the rainbow - blue, yellow, purple - and changing every couple of seconds. This size would feed four hungry sailors, enough for an appetizer and an entree as well. Bro was happy now that he had sacrificed all the ouzo to Poseidon, thanked him, kissed the skipjack goodbye and started cutting fillets on a special fillet table. This is one well equipped chef! Fillet and release: every chef travels with his knives, but only really well equipped ones bring their own rail fillet table. After the bloody work of gutting and cutting was done, Bro took a well deserved nap. Sam hopped along, curious as ever and was keen to see more action. But this was a time to rest. Later there was a time to eat. A well deserved nap - but Sam is always thirsty for more action. "How about some sushi/sashimi?" joked Janko, hoping that he could outsmart the chef at least once. "Hmm, not only did I bring my wok aboard," quipped Bro. "I also have rice, mirin, wasabi and tobiko, so I could make sticky rice and produce some nice rolls. Let's see what else is available and I'll come up with something." Sure enough we had some sake with our rolls. Arigato, Bro-san! And just to give it yet another twist, the rest of the tuna was broiled and served for dinner Livornese style, with tomatoes, white wine, capers, olives, bay leaves, and garlic. Yum! Sushi at night - captain's delight! The next day brought an unpleasant surprise, when one of the sailors routinely checked the bilge for water. Not only was there some, but the bilge was overfilled, water slamming around the floor of the boat. Kona Kai was taking in water! About 150 miles offshore, that was nothing to take easy, and the sailors immediately made sure that their life saving equipment was at the ready. They swarmed out and checked for leaks all along the hull, but nobody could remember that the vessel had hit anything. So what was the reason? "I hope it is not the rudder," worried Capt. John. "If it is the rudder shaft, we have a serious problem." The rudder shaft is a weak point in every seagoing vessel, since it is almost always fully submerged, and it is a moveable part which has to be absolutely watertight - in cold storms as well as in hot doldrums. One can imagine this is not easy to repair, even in a safe harbor, much less on the open sea. As soon as Capt. John disappeared into the vault, Sam showed up, hopped down below and paid close attention to the labors of the captain. Even when we pulled him up again, the curious sparrow decided to further scrutinize the engine room, and the crew waited for more than half an hour before the bird resurfaced and they finally could close the engine room hatch again. Luckily, the water didn't come in along the rudder shaft. So from where did it leak? Resurfaced from the engine room: Capt. John, fingers bruised and head oiled, studies the engine manual. The answer was quite simple: The stern of this elegant double ender vessel had a compartment to store gas cans. To avoid the risk of an explosion due to leaking cans, this stowing room has a little vent hole as low as possible, just above the waterline. The crew had packed this compartment with gas cans, diesel canisters, diving gear, hoses, cables, and last but not least the inflatable life saving raft. Two of the sailors were built quite portly, and when the whole crew sat in the cockpit, poor Kona Kai was just too tail-heavy - the vent hole turned into a water hole. And Sam was probably the straw on the camel's back, so the portly sailors blamed it on the sparrow. Relocating some gear toward more forward parts of the boat solved this issue for good and everybody relaxed. Capt. John and Sam relax over a cup of coffee after the leak is found. The next morning was more quiet than usual. At times the sailors weren't sure if Sam was still alive, or squished to death in his berth filled with all sorts of boat gear, or if he was aboard at all, since once in a while he took off to the mast top for a farther view. After two and a half days of continuous excitement, the sailors were used to setting their feet most carefully on the ground not to flatten their little companion, but maybe Sam had just taken off to new horizons. He might have spotted another boat far away the crew couldn't see from down below in their cockpit. At least when they cleaned out the boat at their final destination, there was no sign of Sam. That made all the sailors smile, since they deemed him safe and free and on his way. A hitchhiker on the seven seas, jumping ship whenever he felt the urge. Arr, matey, take good care and fare well! Staring at the sea, Sam will take off shortly to new horizons and other ships he can enter. For more about the trip see the Map of the Voyage of Kona Kai. But the follow up is quite close: wind in your sails. 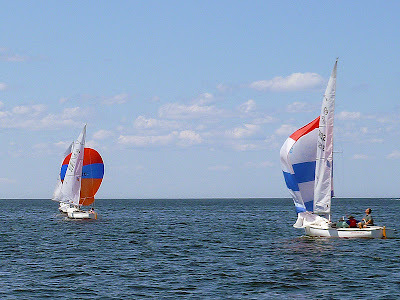 I was lucky to join races at the Sandy Bay Yacht Club races on Star boats (awesome!) and on Rhodes 19. The club in Rockport, MA, on Cape Ann sports other one design races as well, for example on Bulls Eyes, Flying Scots and 470s. These two pics - thanks to Mike Lane - show the start of the Rhodes 19 division on June 29th 2012 and my humble self skippering Brian Bones' "Amenomania". Which is a clever pun, me thinks: This word was invented by Shackleton's crew members, sitting tight on their ice floe after the "Endurance" was lost. Only wind or death could free them from their misery - so they got obsessed with the force and direction of the wind. Trimming the spinnaker in weak winds on "Anemomania". Brian was so nice to let me sail his boat this day, but I couldn't have done it without the two avid star boat racers Ted and Mason. Mason took me out on a star boat race the day before. Whoaa! That is real fun, even that keeping the back stays in shipshape order requires some adjustment. Not exactly rocket science, but I definitely had to get used to it. But once you are airborne... you won't go back.